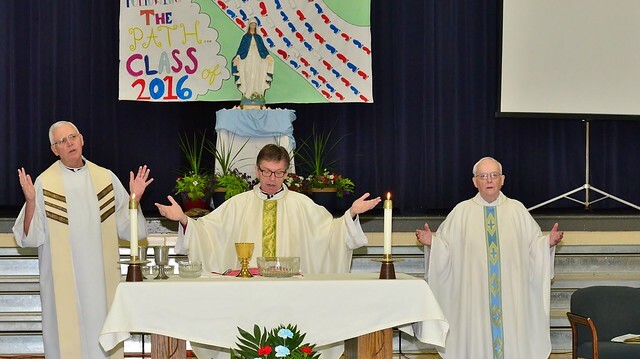 Each year, Baccalaureate is a time for the Villa Angela-St. Joseph High School community to come together to celebrate Mass with the graduating class and recognize their outstanding accomplishments. 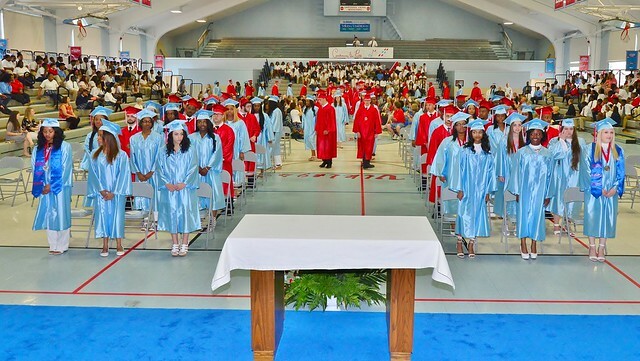 Each year is a special day in the Viking Village but there were several aspects of this year’s Baccalaureate that made it an extra-special event. 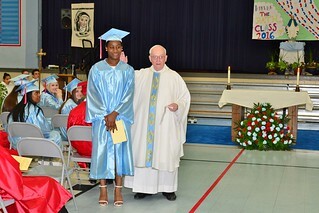 Baccalaureate began with Mass which was concelebrated by former VASJ Chaplain Fr. Jim Bartlett, SM, who also served as homilist. Fr. Jim, who retired as VASJ’s Chaplain two years ago, traveled all the way from Texas for the occasion. Fr. 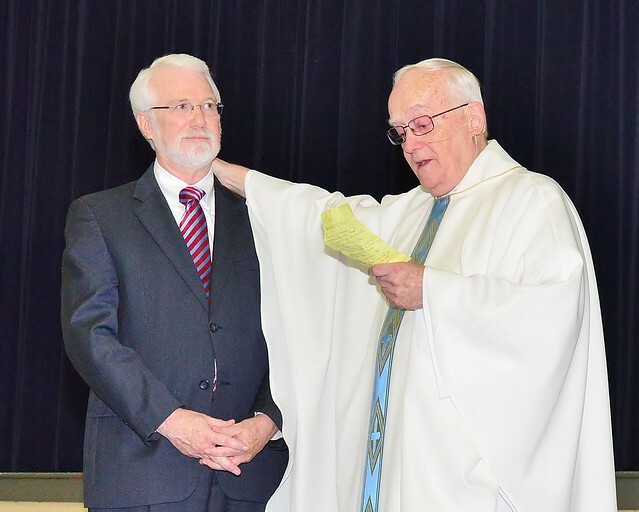 Jim has been a Marianist priest for more than 40 years but states his time spent at VASJ remains the most satisfying of his career. So at last year’s Baccalaureate when the juniors asked him if he would return once again for their Baccalaureate, he agreed immediately. Fr. Jim ended his homily by asking the graduating seniors to place their hand on their hearts. Mass presider was Fr. Joe Fortuna, Pastor of Our Lady of the Lake Parish, who came to VASJ each week during the past school year to celebrate Weekly Mass with OLL parishioners and VASJ students. Fr. Tom Johns, uncle of graduating senior Sean Johns and pastor of St. John Vianney, also concelebrated. From left to right: Fr. Tom Johns of St. John Vianney, Fr. Joe Fortuna of Our Lady of the Lake and Fr. Jim Bartlett, SM. The VASJ Men’s Choir, a new group at VASJ, performed a special rendition of “Lean on Me” for the graduating seniors. Their heartfelt performance was well-received and very appropriate for the occasion. Baccalaureate Mass also included the Passing of the Mantle, a tradition that began at VASJ several years ago. The Passing of the Mantle is when the current Student Council President and Senior Class President transfer their leadership sashes to next year’s leaders. Student Council President Victoria Francetic ’16 passed the mantle to Makayla Potts ’17 while Senior Class President Morgan Adrine ’16 passed the mantle to Janae Johnson ’17. 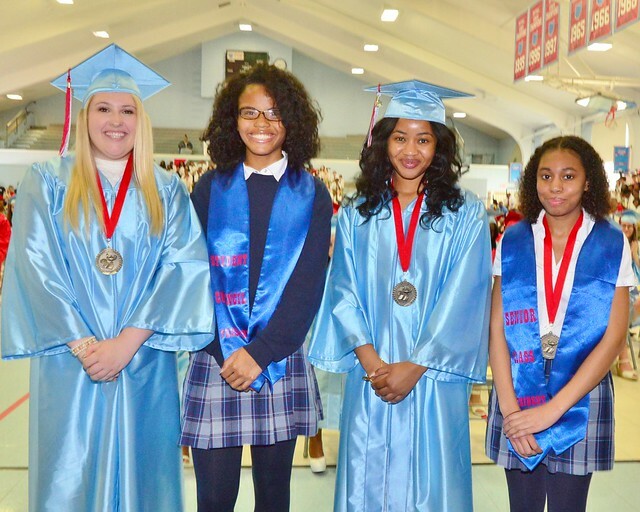 From left to right: Victoria Francetic &apos;16, Makayla Potts &apos;17, Morgan Adrine &apos;16 and Janae Johnson &apos;17. The Mass concluded with a final blessing in which Fr. 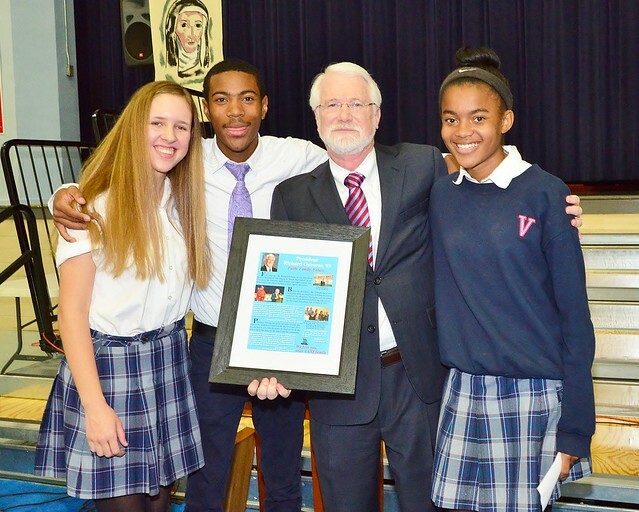 Jim recognized retiring VASJ President Richard Osborne ’69 for his five years of service to VASJ and the many positive changes the school has seen under his leadership. A group of three sophomores, Melanie Mitchell, Chris Boykin and Erin Osborne, also paid tribute to Osborne by presenting him with the framed print of the dedication page that was included in the Class of 2016 yearbook. Erin Osborne &apos;18, Chris Boykin &apos;18, Richard Osborne &apos;69 and Melanie Mitchell &apos;18. After Mass concluded, senior achievement awards were presented to the graduates in honor of their outstanding accomplishments and excellence. One such accomplishment was the announcement that the Class of 2016 has earned $6.6 million in college scholarships. Valedictorian Olivia Vidmar was presented with the American Mathematics Competition award while Salutatorian Rachel Smith was awarded the News Channel 5 Best in Class award. Receiving the Bernard J. Guilfoyle Award (the first time two seniors have been selected for this award) were Kasie Jordan and Anthony Durk. 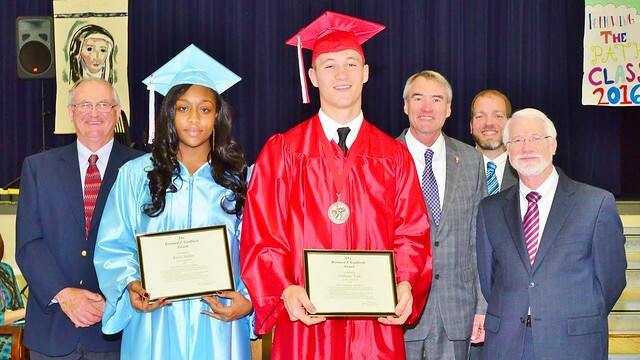 Receiving the Viking Service Award for tremendous community service while at VASJ were Morgan Adrine, Magdalena Boru, Cara Faddoul and Jacob Kozak. The awards presentation ended with a special tribute by retired Lieutenant Colonel and 1980 West Point graduate Mr. Gary Minadeo ’74 to Jacob Stauffer for his appointment to the United States Military Academy. Of the 13,000 applicants each year, only 1,300 are selected. 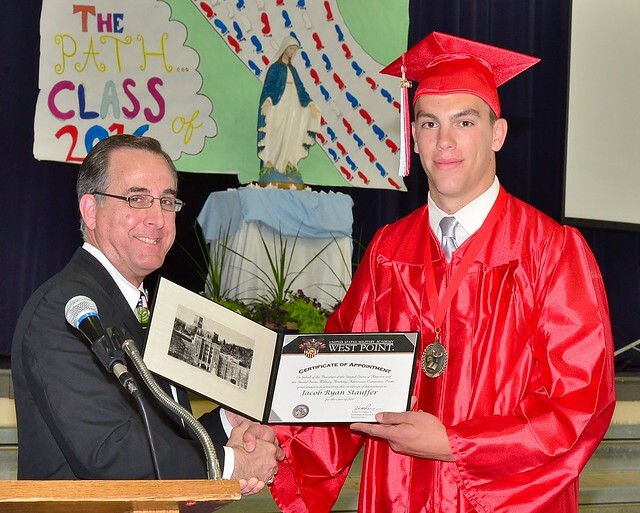 View all 2016 Baccalaureate photos by scrolling through the album below. The full list of awards is listed below. View PDF of awards here.